Spring in the desert of Southern California is full of beautiful things. This particular Friday evening, was no exception when I went for a ride with a friend to the desert. Warm winds moved the branches, and hair, but did not chill the body. It was evening, and the sun was very low, creating long shadows, and a little later, as the sun dropped behind the mountains, no shadows at all. 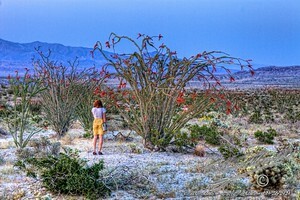 I have several favorite images of the evening, but I always come back to this image of Jenivive looking at this large, and beautiful Ocotillo. This entry was posted in Fauna, Flora, Flowers, Landscape, Lovely Light, Painterly, Purchasable - As Art Prints, Woman. Bookmark the permalink. Thanks Vern. It is certainly pretty out in the desert right now. Nice shot of the Ocotillo Jack. Looks like a great year for desert bloooms.